One night, I dreamed that I was alone in the darkened streets of Rome. 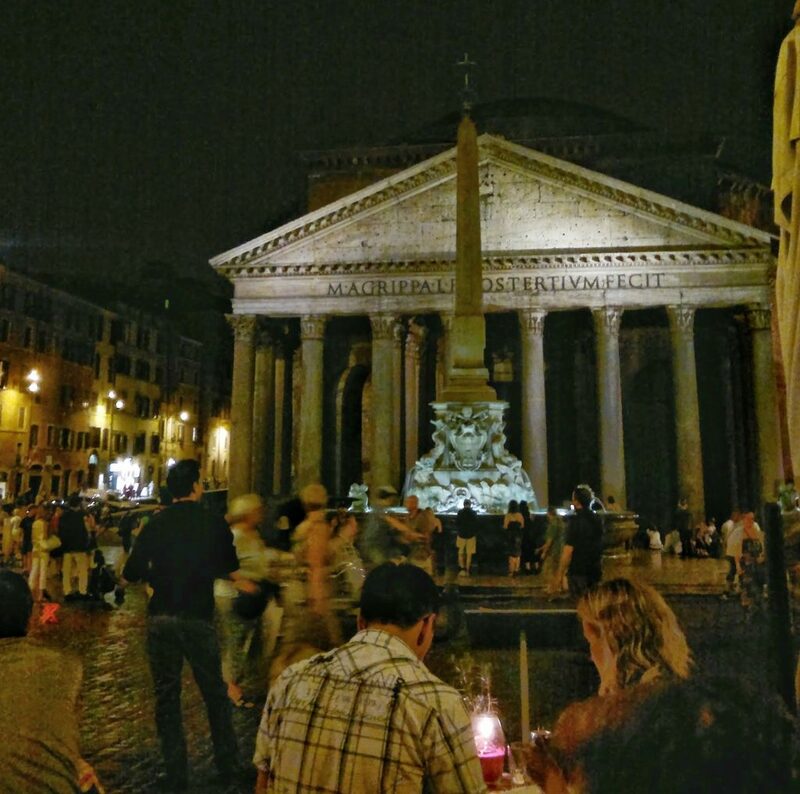 Rounding a corner, there was the Pantheon, lit up in the night, its enormity and beauty breathtaking. Stunned, I couldn’t believe how lucky I was to see it if only in a dream. What was I doing there? Why was I alone? It would be ten years before I knew. In December 1999, I traveled with artwork lent to an exhibition at the Chiostro del Bramante, my first trip to Europe alone. 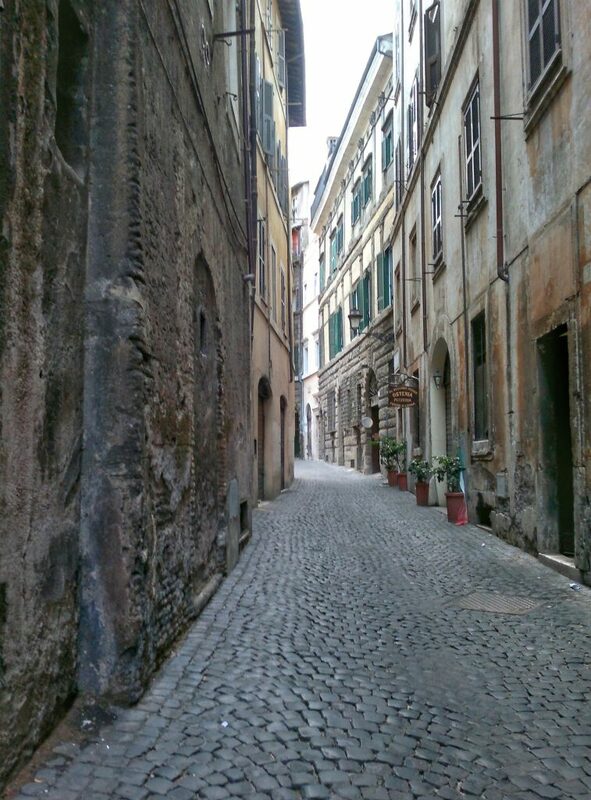 After a two-day journey, in the still dark early morning hours, my taxi made its way down the narrow via dei Pastini to the Hotel Pantheon. Beyond exhausted, my limbs trembled as I undressed and got into bed; once I lay down my heartbeat racked my body. It felt wonderful to be still in my small, elegant room. I wondered about all the incarnations the building had undergone over the centuries, and who had lived and died there. Determined to make the most of two free days before reporting to the museum Monday morning, I planned to sleep for three hours and get up to see the newly restored Sistine Chapel. This was way before booking tickets online had become a norm, and you had to arrive early and expect to stand in long lines. The streets were filled with a fine mist and dim, blue December light as I set off the next morning. Only a few people were out, elderly women walking dogs, men rushing off to one of the few jobs that required Romans to be out at that hour. Walking a few yards from the hotel entrance, the Via dei Pastini opened onto the Piazza della Rotonda and suddenly there was the Pantheon, even more beautiful and majestic than in my dream. It wouldn’t open for some time, and so I pressed on, trying in vain to follow the directions I’d written out so I wouldn’t look like a tourist pouring over a map. However, it took a while to find the street signs carved in marble, set high on building corners, the letters blending in with the stone. Eventually, feeling brave, I shoved the notes into my bag, and headed off toward the river. Wandering through the back streets of the Piazza Navona I marveled at the winding lanes, patterns of cobblestones, and wondered what it would be like to peek inside the old buildings. 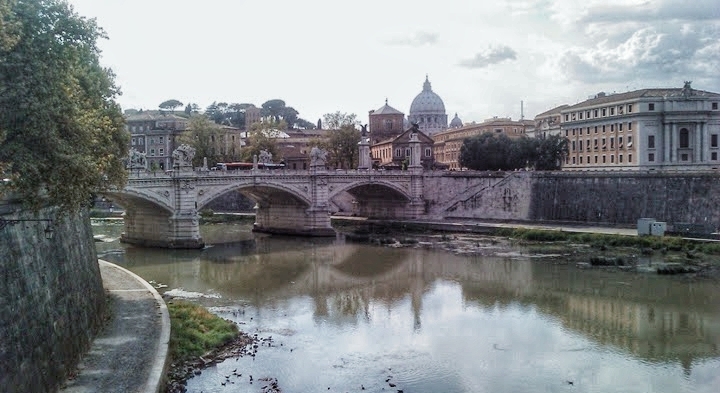 Soon I came upon the Tiber and I knew to turn left. 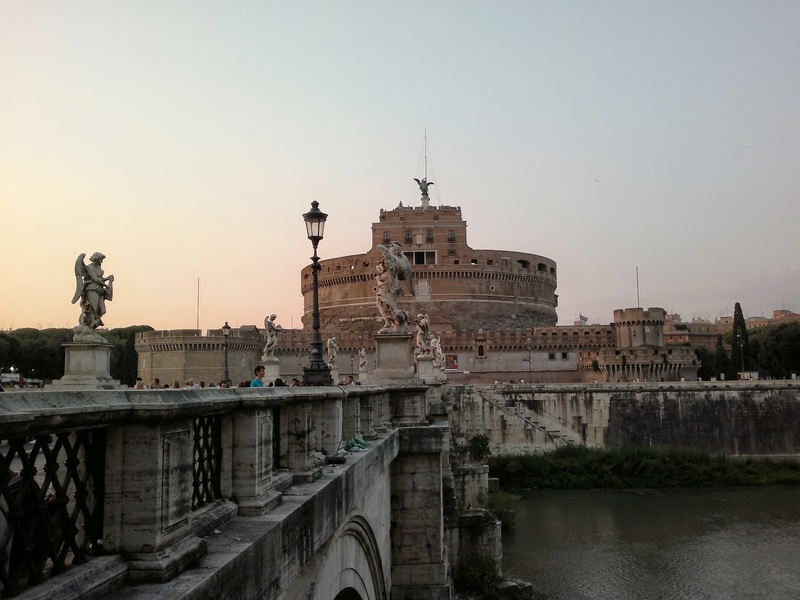 Down river stood the stunning Castel Sant’ Angelo and its romantic bridge of angels; and beyond, rose the dome of St. Peter’s. 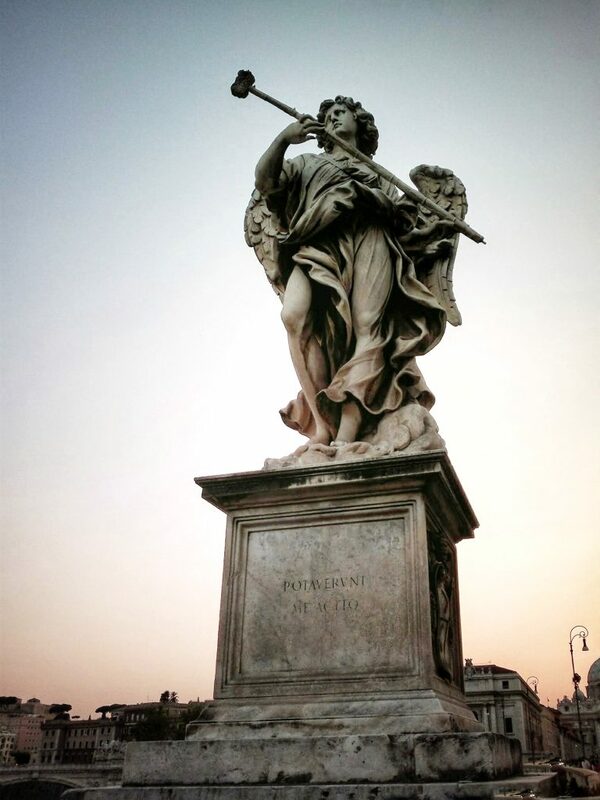 After crossing the Ponte Sisto, I turned left toward the arms of Bernini’s colonnade. The square which is really oval, was almost deserted, the enormous basilica a bright white, gleamed as the sun rose in the sky. A Christmas tree stood beside the obelisk and a structure was being constructed for the nativity scene. I wouldn’t be in town long enough to see it though. Around the corner, I found myself tenth in line at the entrance to the Vatican Museum. Once inside, I rushed through the maze of galleries with a new burst of energy, ignoring everything on the way, my sole purpose to see the Sistine Chapel. But when I arrived, it was closed for a papal ceremony that afternoon, which I would later learn was the unveiling of the restoration work, still controversial at the time. Life doesn’t always work according to plan. Exhausted and jet lagged, my expectations dashed, I could have cried and felt gypped. Instead, I shifted my attitude in what would be a defining moment in my travels over the years. I chose gratitude, thankful to be in Rome at all, and resolved to enjoy my time. These trips were a bonus of the job, any free time to explore a tremendous gift. I resolved to try again Monday morning before returning to the Chiostro. Later, I entered the enormity of St. Peter’s Basilica. Behind a curtained chapel I offered thanks for my safe travels and the amazing day. The basilica was beautiful, immense, and overwhelming. After a time I circled back to Michelangelo’s Pieta, created when he was just 24 years old, protected by bulletproof glass because a man had taken a hammer to it in 1972. The marble highly polished, light bounced off each of Jesus’s ribs. Although not as luminous, I felt Mary was the true subject of this artwork, the one left behind, alone with her child in death as in birth. I was startled by her serenity, Michelangelo did not depict her in anguish, but in silent, private mourning, or prayer. His genius was in conveying her hand held palm up, offering her son to God, the moment she makes peace with this. Exhausted but happier than I’d ever been, I made my way slowly back to the Piazza della Rotonda. Though it was chilly, there were tables set up outside the restaurants and I chose one directly across from the Pantheon, the facade and fountain dramatically lit in the waning light of early evening. 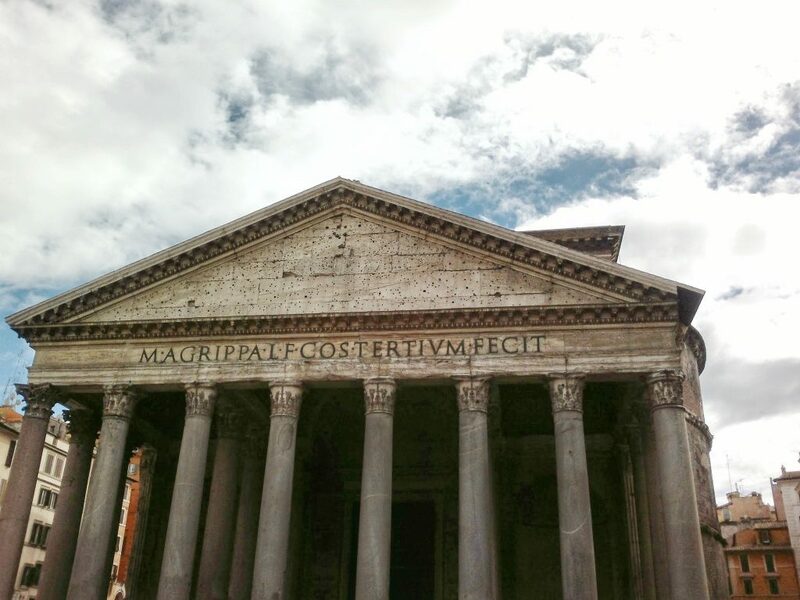 It was incredible that the Pantheon had been not only standing but in use since the early 2nd century A.D. I couldn’t keep my eyes off of it as I tried to impress every detail in my memory. As I lingered over dinner, I observed the life of the piazza. A band wove between the tables playing oompah music, couples strolled hand in hand, people met up at the fountain to discuss the day, older ladies in fur coats licked cones of gelato, the daily passiagetta. In a scene acted out for generations, everyone seemed to belong, to know how to dress, how to act, what to do and when to do it. 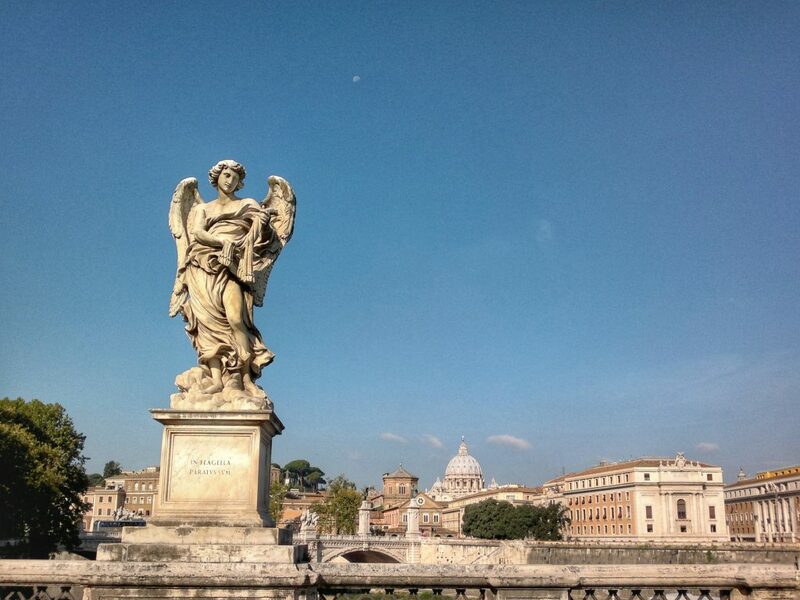 It had been a magical winter day in Rome and I’d fallen in love with the city. 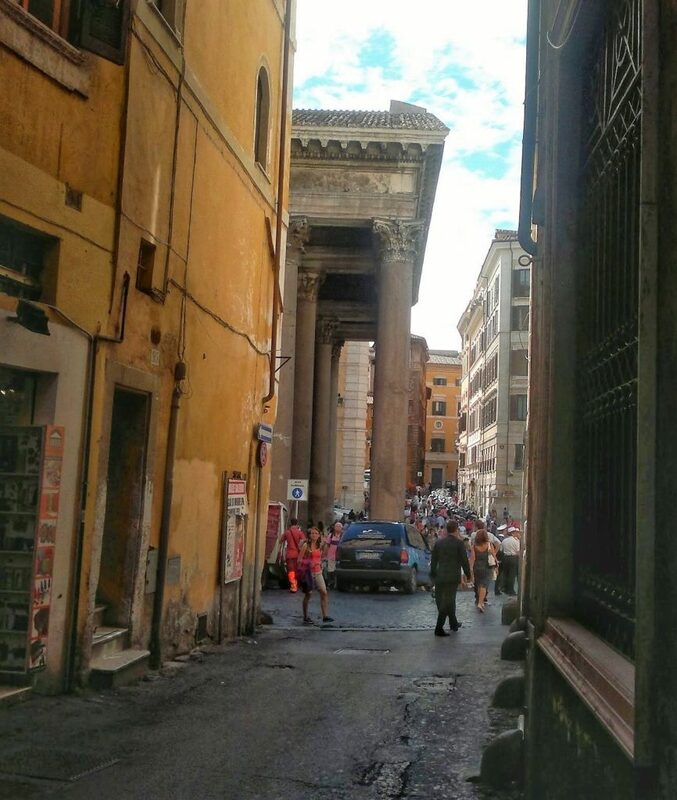 Dizzy from exhaustion, I slipped into the via dei Pastini toward my hotel, the Pantheon could wait another day. I’ve been lucky to visit Rome in winter, spring and summer. Each season offers a unique view and experience of the city. However, on this trip I discovered the joys of traveling in winter. Although many European capitals enjoy robust year-round tourism these days, they are a bit less crowded in the winter. It’s special to see the festive Christmas lights, nativity scenes, holiday sweets, and markets, which I will write about in a future post. Somehow, I feel I’m experiencing the real city at that time. My best advice is to bring a warmer coat than you think you’ll need, dress in layers underneath, bring gloves, and wear the most comfortable boots you can find. In Rome especially, the streets are mainly foot breaking cobble stones. Also, bring an umbrella for each person; the lanes are too narrow to share and you both end up pretty wet otherwise. Many private tour guides and companies also offer special access and off hours tours of the Vatican Museum and St. Peter’s Basilica. 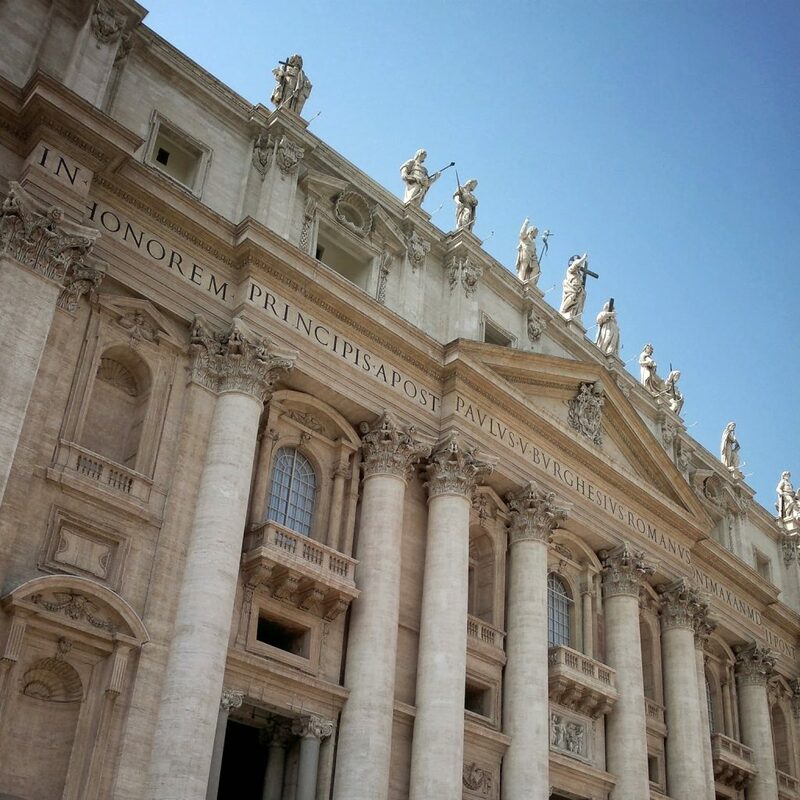 There are also many Americans who reside in Rome and offer private tours. These may be a great option for those short on time or who prefer a more personal experience.